Mutt Muffs are designed not to block out all sound, but to be a passive, noise reducing device that will make a ride in an airplane -- or time spent in any noisy environment -- a comfortable experience for your best friend. Please scroll down for more information including advice on size selection. Dogs aren't our only animal friends with sensitive ears; check out our horse ear plugs, too! One pair of regular black Mutt Muffs Ear Muffs for Dogs. One pair of special colored Muff Muffs Ear Muffs for Animals. Note: NO Returns or Exchanges are accepted on these special order Mutt Muffs. 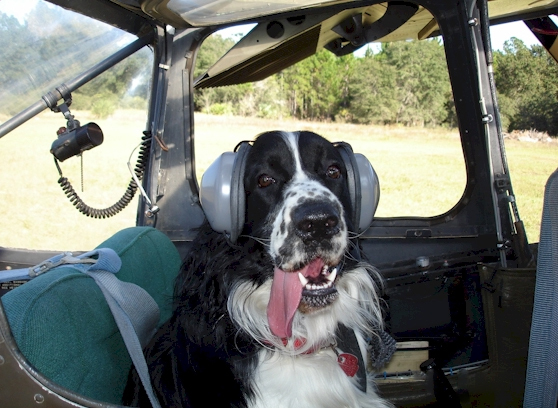 With his Mutt Muffs on, Charley is Robert's co-pilot! Specially Designed Wide Foam Filled Ear Seals for Maximum Comfort. The first thing taken into consideration for decibel reduction while designing Mutt Muffs was the acoustic properties of materials used. Mutt Muffs	materials were selected on the basis of their usage in human hearing protection devices that gave an average advertised reduction of 20 dB. So that, or better, is the dB reduction number Mutt Muffs were designed for. The second consideration was the high frequency noise that is beyond the range of human hearing. Assuming the noise reduction properties of Mutt Muffs is in the 15-25 dB range at human frequencies, we can assume an even better number in the high frequency range for the simple reason that higher frequency, shorter wavelength sounds are easier to diminish then the longer wavelength sounds that fall within the human hearing range. Mutt Muffs are available in regular color (pictured) and in special colors! Red, blue, and pink mutt muffs are available, but they must be special ordered. Note: NO Returns or Exchanges are accepted on special order (color) Mutt Muffs.